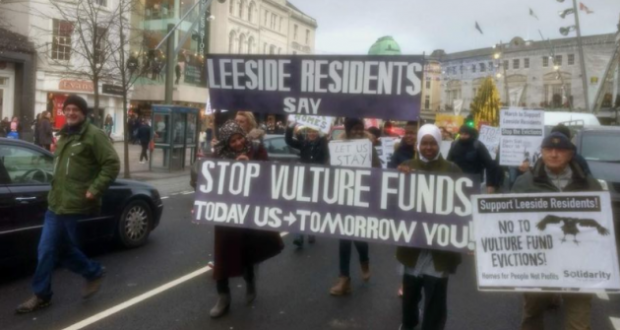 The year and a half long struggle of the residents of the Leeside Apartments in Cork City, against the vulture fund which purchased the distressed property in 2017, culminated in a victory this month. The large apartment block with the capacity to house over 75 households was sold to Cluid Housing Association and funded in cooperation with Cork City Council before renovations were even complete. This was after the landlord came under significant and sustained pressure by the anti-eviction campaign. The remaining 13 households from the original residents will now be guaranteed tenancy and a reduction of rents to affordable levels. As well as this significant victory for the tenants themselves, an additional 59 households will be housed at Leeside from the Council Waiting List. The victory of the Leeside Apartment residents is a crucial lesson for future anti-eviction campaigns. It represents a landmark victory for the housing movement. It shows that public housing and public ownership are key to tackling this housing crisis. Where mass evictions are threatened by landlords and vulture funds, the State should take the properties into public ownership without compensation, halt the evictions, and convert them to public housing. This victory has come from the patience and strength of the Leeside Anti-Eviction Campaign and the year long fight against eviction threats, renovations, moves and precarity. The struggle began in October 2017 when over 30 households met their new landlord and were served notices to quit on the basis of “Renovictions” (using renovations as a basis to evict residents), utilising the well used “substantial refurbishment” loophole in tenancy legislation. Residents were shocked to learn of their eviction notices after seeing notices exposed and taped to their front doors. Others were advised to leave their keys under the door of the empty office on the ground floor when their notice periods expired. Once the building was made vacant, the vulture fund planned to exploit the loophole to circumvent the weak rent pressure zones which restricts rent hikes to 4% per annum. This would result in the tenants facing rent hikes of as much as €1000 per month for a one bedroom apartment or eviction into a housing crisis. 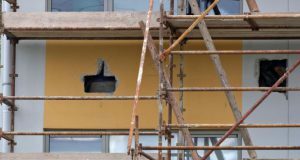 Residents were advised by the vulture fund’s property manager as early as November 2018 that the renovated apartments would be rented at above market rates for as much as €1600 for a one-bedroom apartment. The company’s mission statement at the time, since removed from their website, boasted about their orientation to purchasing property cheap, and re-let to “young professionals”. The vulture fund did not expect the residents, assisted by Socialist Party and Solidarity representatives, to mobilise widespread support throughout Cork and in society in general. In December 2017, the residents rallied over 300 people in Cork city centre to march against vulture funds to the demand of “Today Us, Tomorrow You” and there were consistent media interventions. The demand for an end to all economic evictions was at the heart of the campaign. 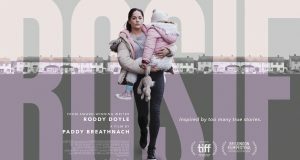 The self-described “Value Investor” Lugus Capital, the Irish expression of vulture fund Bain Capital founded by Republican US presidential nominee Mitt Romney, conceded into selling the apartment block before renovations were even finished on the basis of the militant campaign by the residents to resist eviction. The landlords were ultimately defeated through working class people self-organising to fight for their collective interests by challenging the reputation and potential profits of Lugus Capital, hitting them were it hurts. The Leeside Apartments struggle is a rare and significant victory in the context of an escalating housing crisis and a political establishment wedded to the capitalist market to solve this crisis. The development of a movement around housing, mass resistance to evictions, and pressure from below could force real change on the dysfunctional housing market. 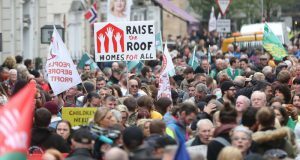 Solidarity and the Socialist Party are currently campaigning to have the Anti-Evictions Bill which would ban economic evictions, passed late last year, pass through the required Dáil stages as a matter of urgency.